Two soldiers, one of them IDF (Krav Maga trained, one supposes) dueling with knives. The icepick grip is popular in recent movies, but the soldier using the more standard grip and straight thrusts wins the day. That's why you don't knife fight like that. You charge in and absorb the one blow that your enemy will be able to deliver, preferably blocking, deflecting, or enduring a non-lethal wound to an extremity. Then you bury your knife into his vitals and continue stabbing him repeatedly as you overwhelm him. The author of "Put 'em Down, Take 'em Out: Knife Fighting Techniques From Folsom Prison" says that the hammer grip (standard grip) is the only one that "means business" in a knife fight. I have had knives pulled on me. You don't run into them. Icepick grip is pretty silly. Nobody uses the icepick for any sort of knife task. I have no idea why people would think it would work for fighting. As a blocker in the off hand still forward. it is harder then you guys think to sink a blade in the body far enough to do real damage.this is why poeple use the ice pick grip.swinging your arm like a hammer has much more force then a upper cut like jab.at least in terms of self defense,where your just trying to get away,not fight to the death.knife vers knife fighting is pretty rare situation,all about training at that point.not much need for a prison style shanking in the real world ether.by that i mean a under hand swing from behind into the ribs,face or kneck,total suprise attacks isnt defense. that video seems like they would of been superficial wounds.you want to see real world effects of knife/stab wounds.look at prison videos of attacks.you can see how durable the human body is vers a blade or shank. it is harder then you guys think to sink a blade in the body far enough to do real damage.this is why poeple use the ice pick grip.swinging your arm like a hammer has much more force then a upper cut like jab.at least in terms of self defense,where your just trying to get away,not fight to the death.knife vers knife fighting is pretty rare situation,all about training at that point.not much need for a prison style shanking in the real world ether. Kill a hundred kilo pig to death with a sabre grip. Humans are more durable? I had a family member who was a biker back in the day, went to prison and all that. He said the "best" way to stab somebody was with the icepick grip and use your other hand to help assist with the thrust and push the pommel into the persons abdomen. But that's merely stabbing someone, not necessarily a blade on blade knife fight. Prison fights are certainly unique to prisons, and many times it's one knife against an unarmed person. Also, the blades are typically crude and not ideal for stabbing and killing. That's why I stated previously to absorb a stab or slash if you have to, and neutralize their stabbing arm. That at least will limit the number of times you will be stabbed and ensure you get some viscious strikes of your own in. But admittidly you could still incur a mortal wound in the process if the other guy gets lucky. Well, if you are going to kill them, you might as well kill them to death. How else would you get an idea on what physically works? A pig is a real thing you can do tests on. What is the basis of your stance? The Ice Pick grip is used at close distance not at long range like the IDF guy did. Also neither went for the neck which I assume was not allowed because neither guy went for it. The neck is the best target because it is the least protected part of the body because not too many people wear clothing that covers the neck. What the IDf guy should have done is close the distance by using his right arm (Ice Pick grip) to knock down the Airborne guy's blocking arm and then use a Shoulder Stop to block Airborne guy's strike and then counter with strike to the neck. Shoulder Stops are very effective because the shoulder does not move much compared to the arm plus it stops the arm from moving forward which would have stopped the thrusts. I'm definatly no expert but I would imagine a forward grip would be superior if using a sharp knife but a reverse grip would give more power if using something like a screwdriver or a sharpened up tooth brush like whats used in jails. I would have thrown sand in the opponents face, then attacked. I suppose the point was that a weaker, smaller person could bring more force to bear, swinging a bent arm and closing the elbow--but I'm not sure. It could also be that it would be less expected. But the Roman gladius was sharp on both sides, and my hunting knife isn't. For the upward thrust to be most effective it seems that the blade would have to be up (like the claw end of the hammer), to punch in and rip upward, not down as you would hold it for the ballet knife fight in West Side Story. Does this seem right? Of course it also means the blade is facing me in other positions with my arm bent. Whichever way you hold it, only one sharp side limits your options. So what is your take on this?. What are the better thrusts mechanically for a smaller less fit person in a desperate situation? And how any ideas about mitigation or follow up? Just from the video, they should probably try actually attacking each other rather than having a sparring match. Neither of them did anything to try and actually 'win'. I've found through force on force and sparring matches with training knives, that, like so many other things, "it depends" is the right answer. 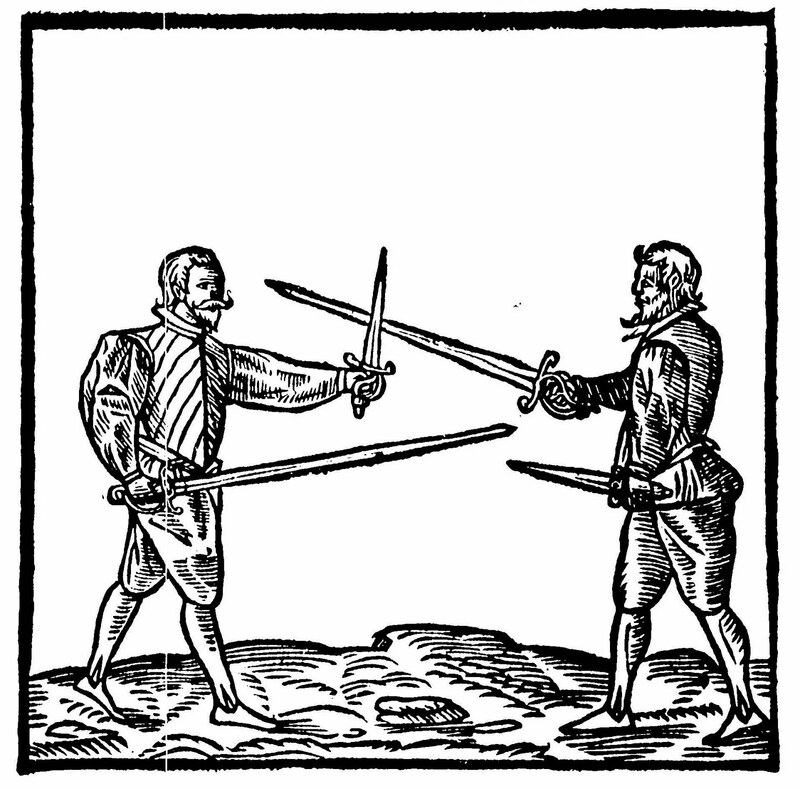 In my experience, if both guys are facing each other, ready (as in a duel), reverse-grip doesn't work very well, due to the lack of reach versus someone using some sort of a forward grip. HOWEVER, when responding to a sudden, violent attack that you didn't see coming (where you are behind the reactionary curve), both forward and reverse grips work about equally well, with the reverse grip having a slight advantage. Due to the bad-breath distances involved, there is no advantage to the longer reach and greater technical dexterity afforded by a forward grip; the increased stabbing and ripping power afforded by a reverse grip however, does make a difference. The most important thing, however, is just to get the blade out in whatever grip you can, and GO TO WORK. What grip you use is secondary that that principle. Edited to add: When responding to a sudden, unforeseen attack, the first thing you're going to want to do, is to either intercept or redirect the initial attack, then deliver a counter-attack of your own; if a knife is going to be a part of your counter-attack, you're going to have to be able to draw it smoothly at some point during the fight before you can actually use it. That's why, if you carry a knife for defense, its important to practice drawing it under stress the same way you would practice with your gun. Just being able to get your blade out and into play quickly may be far more important than how good you are at using it, although that is important as well. I also prefer a fixed blade carried IWB at about 11:00. - In a self-defense situation, responding to a sudden, violent assault, I prefer either forward grip, edge-in or reverse grip, edge-in (aka Pikal grip) due to the increased stabbing and ripping power, and simplicity of use.